The Roman Anglican: Christ upon the Mountain Peak: the Transfiguration. Christ upon the Mountain Peak: the Transfiguration. One would think of summer as a liturgically bland season, the seemingly endless stretch of ordinary time seems to suggest that the Church is on vacation! It is perhaps for this reason that the Medieval Church used summer as a time to celebrate important saints, such as martyrs or even the Virgin, but also an important feast of Christ, one so significant that it possibly occurs in August because it does not belong to Christmastide or Eastertide and needs a place of its own, it is the feast that shows the glory and divinity of the yet "human" Christ over the religion and prophets of old; the Feast of the Transfiguration. Transfiguration - Perugino - c.1497 - Fresco - Collegio del Cambio, Perugia. The Transfiguration of Christ, on Mount Tabor with Moses and Elias, is found in the Gospels of St. Matthew (17.1-6), St. Mark (9:1-18), St. Luke (9:28-36) and to a lesser extent in St. John (1:14) and in one of St. Paul’s epistle (2 Peter 1:16-18). It is indeed the culminating moment of Christ’s public ministry; starting with his Baptism and ending with the Ascension, but indeed this is the moment during his earthly mission in which he openly shows that he is not only capable of prophetic miracles but that he belongs to the highest sphere of heaven. Already during Jesus’ time, the mount of the Transfiguration was known as the “holy mount” (2 Peter 1:18) and tradition identifies it with Mount Tabor. In the third century Origen writes that it is indeed the mountain in Galilee in which Christ was transfigured and in the following century St. Cyril of Jerusalem and St. Jerome also state the same. On these strong basis the Fifth Council of Constantinople erected the see of this mystical event. During the late 6th century the Byzantines built three shrines, which grew during the Middle Ages and became a monastery, which later became a Benedictine abbey, then destroyed by Sultan al-Malik al-Adil in the early 13th century. In 1631 the Franciscans took possession of the mount. The event took place during Christ’s sojourn in Caesarea Philippi; Jesus took Peter, James and John with him to a high mount On the mount, Christ’s body emanated a dazzling brightness, a sign of divinity, changed his earthly face to reveal his godly one, besides him appeared true Judaism in the form of Moses and Elias, representing the law and the prophet that foretold the coming of the Messiah, adoring the Christ. A cloud appears from above and the voice of the Father proclaims Jesus as his only begotten Son, Christ emanates a blinding light, symbol of his divine nature. This concludes the earlier line in which God the Father announces the death and resurrection of Christ, now the Son reunited his closest disciples at the announcement of the glory and heavenly delights waiting for everyone, the conclusion of this process and Jesus’ divine proclamation as God; Jesus of the Cross and Passion, the Christ of the Resurrection, Ascension and heavenly glory, it is indeed a revelation. The Transfiguration of Christ is an anticipation and a preview to the Resurrection, to Christ's truly divine nature and salvific mission and this event must be understood in the light of it as well as of his death and passion. 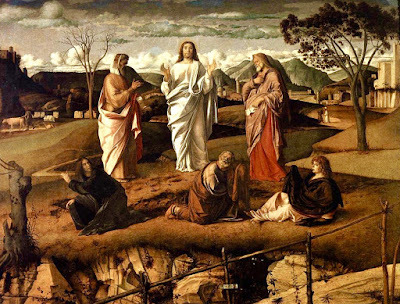 Transfiguration - Giovanni Bellini - c.1487 - Tempera on Panel - Giovanni Bellini - Capodimonte Museum, Naples. 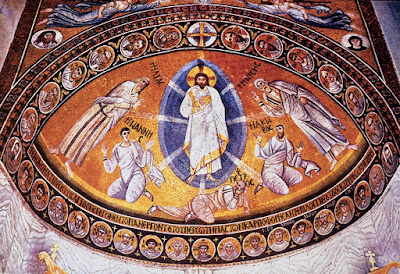 The Feast of the Transfiguration is celebrated by most Christian Churches, the origins of the feast lies in the dedication of the three basilicas on Mount Tabor, it soon spread to the Western Church, the first celebration in St. Peter's Basilica took place in the twelfth century, and it was made a universal feast on 6 August by Pope Callistus III to celebrate the victory at the Siege of Belgrade in 1456, this date was also chosen because according to tradition the Transfiguration occurred forty days before the Crucifixion, and the Feast of the Exaltation of the Cross occurred on 14 September. Interestingly, in the Eastern Churches the Transfiguration is part of the Dormition fast (though fast is not mandatory!) 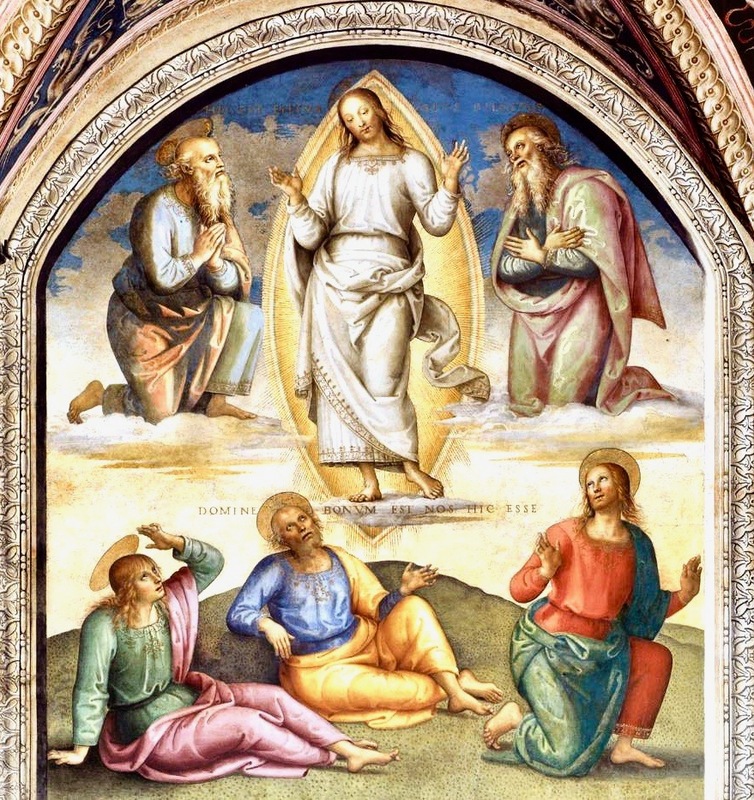 and a beautiful detail is that the Transfiguration is not only viewed as a feast of Christ, but of the Trinity, as not only the Son was taking an active part, but God the Father was the voice from heaven and God the Spirit was the cloud. In England the Feast had a relatively low rank in the Sarum Calendar and after the Reformation it appeared as a black letter day in the Book of Common Prayer, but not as a major feast. 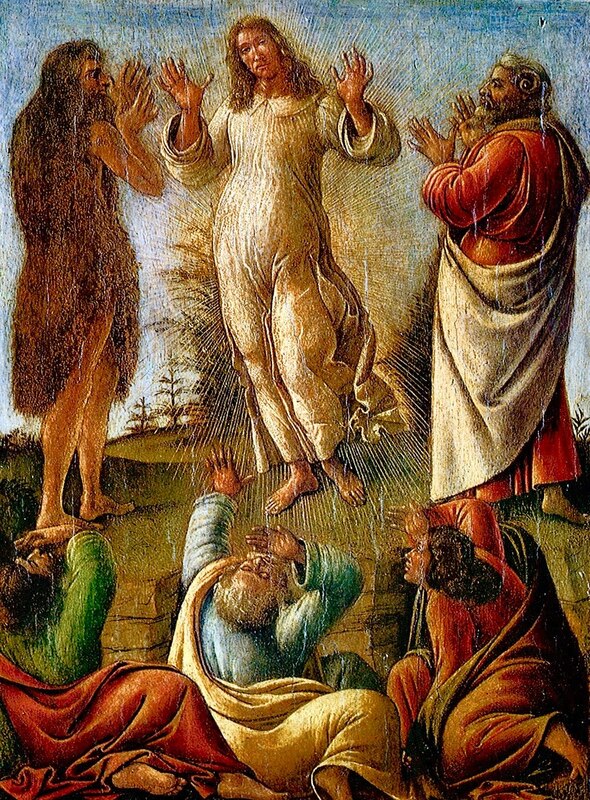 Transfiguration - Sandro Botticelli - c.1500 - Tempera on Panel - Pallavicini Gallery, Rome. 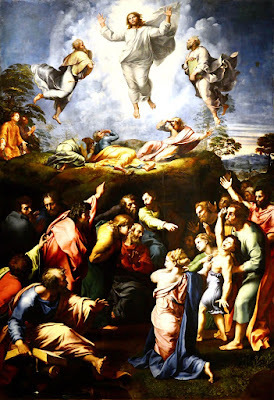 The subject of the Transfiguration is also an immensely popular theme in Christian art; from the early Byzantine icons or mosaics, such as the early one at Saint Catherine’s Monastery on Mount Sinai to the famous Renaissance works of Fra Angelico, Perugino, Raphael or Titian. Iconography follows the Gospels which describe the apostles as afraid but also sleepy, in most works they seem to be just waking up when Jesus begins to shine, at which point they take dramatic poses of amazement. Christ, sometimes floating, sometimes not, is usually shown in a mandorla, (except in post 15th century Western works), emitting light, often through various effects, such as a gilded face. Frequently, God the Father takes the form of light descending from above or as a hand in early scenes. 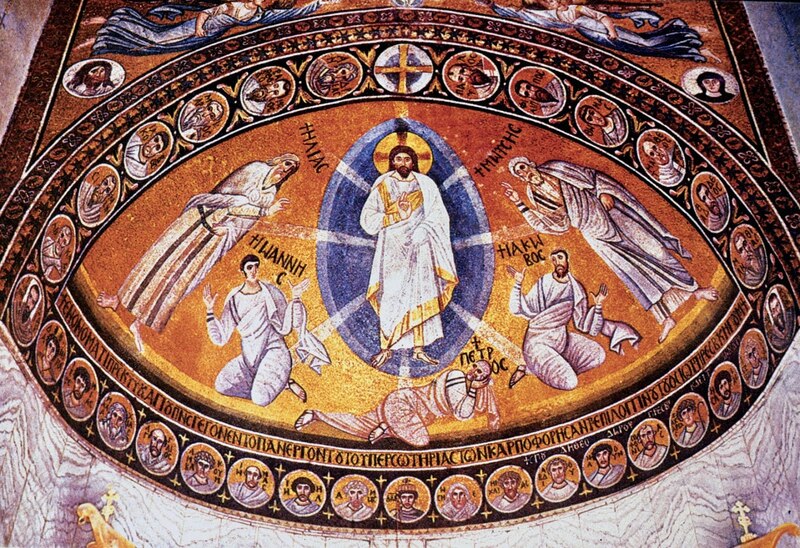 Transfiguration - Byzantine - c.540 - Mosaic - St. Catherine's Monastery, Mount Sinai. The mosaic at Saint Catherine’s monastery on Mount Sinai, probably commissioned by Justinian the Great always held a symbolic place, as it is where the Christ “meets” Moses, this is a rare survival of pre-iconoclasm Byzantine art and it shows Christ standing in a mandorla with a cruciform halo, with the prophets at his side. Below them are the disciples. This will be the theme chosen for most, later Eastern icons. In the Basilica of Sant’Apollinare in Classe in Ravenna, from the same era, Moses and Elias are represented at half-length, God’s hand appears above the scene, but unusually this is a symbolic Transfiguration, Christ becomes a bare Cross within a celestial sphere. Twelve lambs surround the bottom scene. Byzantine iconography emphasised the divinity and glory of God, while since the late Middle Ages, Western Transfigurations emphasised the coming resurrection. 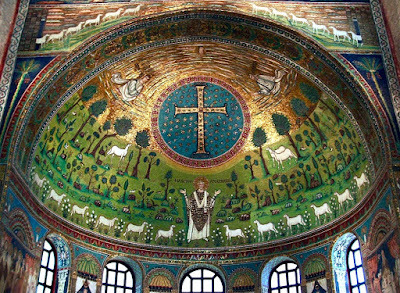 Transfiguration - Byzantine - c.549 - Mosaic - Sant'Apollinare in Classe, Ravenna. In more recent Western depictions the scene usually resolves itself into two zones; usually an upper one with the actual Transfiguration of Christ, the divine part, static, calm and timeless, while the lower zone usually chaotic and frenetic shows the astonished disciples. During the Renaissance the Mount became more of a rock a few feet tall, but the scenes nonetheless maintained their distinction and it is in these cases that the solution of a floating Transfiguration makes more sense, as in the beautiful examples by Perugino or Raphael, whose (last) masterpiece in the Vatican Museum, commissioned by Cardinal Giuliano de' Medici in 1516, is indeed the most important painting of this theme. In Raphael’s work, Christ recalls the composition of the Resurrection or the Assumption and that is the artist’s intent in which two apparently incompatible scenes work together, the solemnity of the Transfiguration and the chaos of Jesus healing a possessed boy, it is also the intent of Western theology, as well as the intent of God, to show his followers that after chaos and death there will be glory, an immense light, an immense peace. 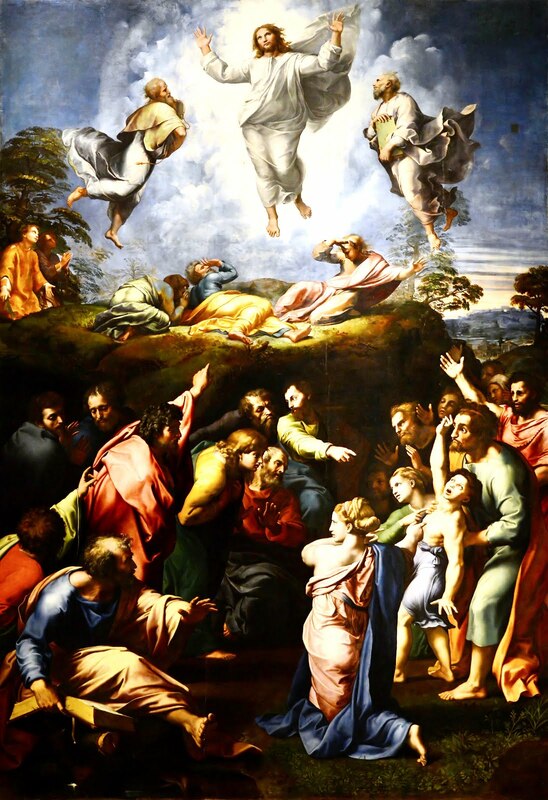 Transfiguration - Raphael - c.1516 - Tempera on Panel - Vatican Museums.